Frank Farnese is a collector of antique books when he chances upon a first edition of Dante’s classic novel The Divine Comedy. Inside the ancient tome is an inscription. Frank finds this inscription intriguing noting it mentions a mysterious garden located in Bomarzo, Italy. Frank wants to visit this garden to learn more about Dante and The Divine Comedy. Frank decides to visit Bomarzo where he finds himself exploring and falling through Hell’s Mouth, a particularly gruesome and odd sculpture. When he awakes, Frank no longer finds himself living in the 21st century. He has somehow, through the works of time travel, in the year 1570. To greet him, is Pyrrho Ligorio, a legendary antiquarian of literature and his lady companion, the lovely Lurcrezia Romano. Both Pyrrho and Lucrezia find Frank to be a kindred spirit and invite him on what is about to be an incredible journey. Thus, begins Teresa Cutler-Broyles novel Dante’s Garden-Magic and Mystery in Bomarzo. Just as in the modern age of 2017, things aren’t quite right in the world back in 1570 and the three of them know they should make things better. Frank and his newfound companions find themselves wrapped up in a multitude of adventures, some exciting, some dangerous, some educational and for Frank and Lucrezia quite romantic. Among their adventures is the infamous Inquisition and an astonishing retreat to the iconic Venice. On their journey they meet people (some who actually existed and others fictional). As this unique tale unfolds, Frank and his traveling companions must learn if these people are true allies or those they should avoid for they are truly perilous (and then there are some characters shrouded in mystery). Did I mention romance? Frank can’t help but fall in love with Lucrezia. Though she is a woman of her time, she is also one with a keen mind and a desire to learn and grow even though educational and vocational opportunities are limited for women. Lucrezia is also a woman with fleshly desires and fully gives herself to Frank despite 16th century sexual mores. Frank so wants to stay in 1570 but also misses his life in the 21st century, not just the modern conveniences, but his relationship with longtime girlfriend Matilda, who he lovingly calls Tilly. Or maybe Frank could find his way back to the modern day and bring Lucrezia with him. But how would she live in a world of modern conveniences that we take for granted? How would she adjust? And would she miss her old life back in 1570? And how would Frank explain his absence? Would Tilly and his friends and colleagues buy his tale of time travel? Hmm, he might as well tell them he was in a coma or kidnapped by aliens. And of course, there is the issue of what brought Frank to this adventure and him questioning his stake in both worlds-his acquisition of an original copy of Dante’s The Divine Comedy. Dante’s Garden is richly written and wonderfully descriptive. Cutler-Broyles has a gift for showing not telling. In my mind’s eye I could see the people, places and things she writes about in glowing detail. In one passage, Cutler-Broyles describes a beautiful gown in shades of green, blue and purple, which filled me with pure joy! If I have any regret, it is my grasp on European history is way too limited, and I must expand my knowledge gained through PBS documentaries, classic movies and vintage fashion. Cutler-Broyles has a vivid imagination and she clearly has a full grasp on Italian history, which isn’t surprising considering she is a visiting professor at the Umbra Institute in Perugia, Italy and has spent the past ten years leading travels throughout Italy. Now I’m left wondering if Cutler-Broyles has a sequel in mind. 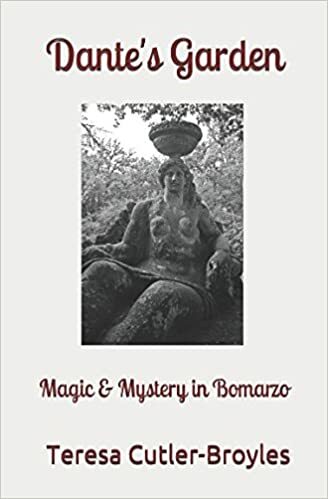 I would love to know how Frank and Lucrezia are affected by their remarkable expedition in the long run, long after their initial story plays out in Dante’s Garden-Magic and Mystery in Bomarzo.